The property is in Colombo 5. 100 yards from the High Level road and it`s close to the Nugegoda and Kirillapone Junctions. Major amenities are all situated within easy reach. ( e.g. 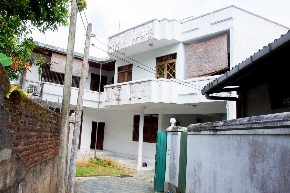 supermarkets, hospitals and banks) Access to the property is clear and through Seibel avenue and Polhengoda road (Vijaya kumaratunga Mawatha). Clear title, and the property resides in a safe and quiet residential neighborhood. Architect Designed Luxury house with Annex solidly built using high standard material. Basement c large office room) two floors and a expansive roof top terrace for entertainment. The property offers extensive living space with 4 bedrooms, 3 toilets and a modern Pantry /Kitchen and an additional 2 roomed Annex with kitchen, bathroom and separate entrance. Separate maids/ drivers quarters and toilet. Electric gate and parapet wall around the property.